How many of you have invested in Unit Trust? How many of you know how? I am not a pro as well in Unit Trust investment so I chose to take a lower risk Unit Trust investment. Malaysia still got a lot of work to do in making Unit Trust work for us. Before investing, I did some research and reading on the good funds out there. 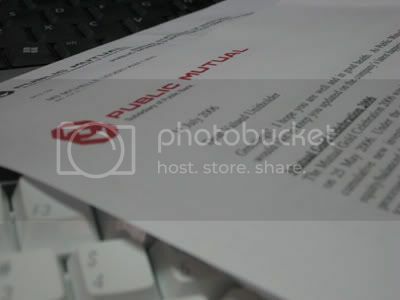 Public Mutual has won a couple of awards and some of the funds have good track record of their yearly earnings. 3)	Must not have any withdrawal from Account 1 in last 3 months. The minimum amount you can invest is RM1K and maximum is 20% of your balance in Account 1 minus 50K. Withdrawal Documents required are 2 copies of your NRIC with clear thumb prints and completed the application forms. It will take 1-2 weeks for it to process if your agent is efficient. I have invest in Public Mutual Savings Fund for 3 years now and the average return is 8%, not bad yeah as compare to the EPF 4-5%. For saving funds, if the company profits, dividends are given to boost up your investment. Lastly, to maximize the growth of your funds, you have to increase the fund yearly by doing a yearly withdrawal. I am not an agent of any of the funds mentioned. In all investment there are risks. Do not simply blindly make an investment based on what agents tell you. Previously I have bought other trust funds that made loses, beware of those. Do the research and see the historical records. Most of it is published in TheEdge or other investment magazines. I never invested in local shares before and I never knew how. I do have an account in US to invest in US shares. That was because my company has a benefit share plan for us to purchase our company shares at discounted rates. Anyway, last Friday, a courier package came and it was from StemLife. The company is going public listed. Cool. 😎 I didn’t read the prospectus, it was as thick as my programming books. I read the form and was tempted to invest. It was a 2 pages form, but the things I have to do, to successfully apply for the shares, is exhausting. I received the package on 29 Sept, the dateline is 5th Oct. Not much time to work with. 1. I have to apply for a CDS account to be able to buy any local shares. Fortunately I know a friend who works in the share trading company. I got her help to get me the CDS account on the same day. 1 obstacle done. 2. I have to make a copy of my IC, front and back on the same page. 3. I have to fill in the form carefully. No liquid paper can be use on the form. 4. I have to get a banker’s cheque. Personal cheques are not allowed. I blog about it yesterday, it was done too. 5. I have to buy two 50sen stamp, one for A envelope and one for B envelope. They will send you back the A envelope with your cheque if it is not successful. 7. Mail it and wait for response. Phew. Now all I have to sit back and wait for them to tell me if it is successful. By the way, the company will ballot, if you get pick, the shares will be sold to you. If I don’t I need to go back to the bank, to claim back the money. I just learn that you can do all the above except for number 1, using Internet banking. In order to do that, you need to setup the account first by submitting a physical form. For Maybank, you can use ATM or Internet Banking. Somehow, I don’t know why StemLife was not listed. It was a great experience though to beat the deadline. If it was from some company that I don’t know, it will probably end up in the bin. Anyone want to know how to invest in US share?